Hard work and improvement in Chemistry at The Sixth Form College, Solihull is recognised every year by way of the John Sleigh award and this year the prize has been given to a former King Edward VI Five Ways School student. Roshan Waqas (aged 17, from Kings Heath) has been judged the most improved student this year. He started at College with a C average at GCSE, but through hard work and determination he has progressed to a grade B following his first year of study, and is also predicted at least B grades in Mathematics and Physics too. Roshan is planning to study Optometry at Aston University following completion of his studies. The prize was set up in memory of a dear colleague and rewards effort and improvement. John Sleigh was a former Chemistry teacher at the College, and this award takes into account progress through hard work from GCSE level attainment to the end of year 12 A level study. 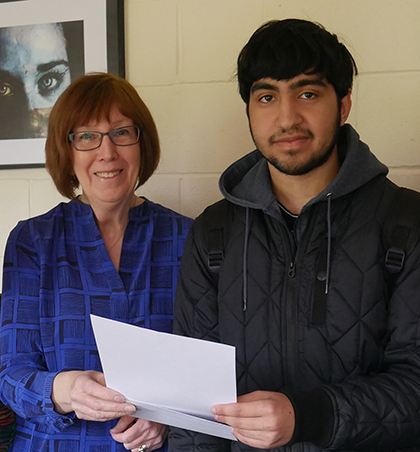 Roshan met with Chemistry teacher Rachel Johnston to get his prize, as well as with College Vice Principal Janice Hamilton and John Sleigh’s widow Jane, from whom he received a certificate to mark his achievement.